There are two main types of martial arts. The first are the soft styles, which use locks, throws, sweeps and take-downs (hapkido, aikido). The other type of martial arts would be the hard or striking styles, which use strikes, punches, kicks and blocks (taekwon-do and karate). We could also include MMA but, as my background is in Taekwon-Do, (8th degree blackbelt), let's focus on this style of martial art. Before I mention how much force and damage you can generate using Taekwon-Do techniques, I should mention that it's primarily a self-defence art and has a large moral culture aspect, where we teach students how to improve their own lives and the world around them. As well as the moral side, there are different physical aspects of this martial art such as patterns, sparring, and fundamental movements - and then, there's the spectacular power breaking part of the art. To understand the physics associated with the ability to break wood and tiles using punches and kicks, we will need to look at things like momentum, force, kinetic energy, velocity, Newton’s laws, acceleration, deformation, and impulse. Many of these topics would be covered by the physics Leaving Certificate syllabus and typical first year physics university courses. Imagine a situation where you are in a physical confrontation and your life is really in danger. You have been studying Taekwon-Do for a year, and you punch your attacker in the nose and make your escape. So what was the purpose of your Taekwon-Do strike in that situation? You were not trying to move your attacker. At the most basic level, you were trying to maximise the deformation damage their nose. From a physics analysis point of view, there are two ways to analyse the situation; the first is to calculate the amount of energy involved in the impact to see how much damage you can cause. The second is to look at it from the forces and stresses you imposed on your attacker. The following analysis is based on work in the 1970s and 1980s such as The Physics of Karate and Karate Strikes. Before we see how much power is in your punch, let’s first look at the conservation of energy. Conservation of energy means that energy cannot be created or destroyed, but just transformed from one form to another. In a car crash, for example, the energy of the car before the collision should equal the energy of the car after the collision. If you measure the speed and mass of a car before a crash, it should equal the speed and mass of the car immediately after the crash. However, our analysis would show that some of the energy has gone into damaging or deforming the car. We call this the deformation energy (E). Like a car crash, a Taekwon-Do strike is a collision between two bodies. We have the mass of the bad guy (MB) who is initially at rest. You’re the good guy and have a mass (MG), and you are moving at a speed v. Using the conservation of energy and momentum, we can use the equation below to work out the deformation energy, or how much energy is involved if you hit the bad guy in the nose. Taking the bad guy’s mass as 70kg and assuming you are only using your arm in the punch (mass of arm is about 7kg), and the speed of your punch is 7m per second, this gives us a deformation energy of 157 Joules. "Martial artists have been testing their skills on timber for a long time, knowing that if they can break a piece of timber with a punch, that it is an effective punch and this builds confidence in their technique"
But what does delivering 157 Joules to someone’s nose mean? We know from research that the impact last for about 10 milliseconds (10 one thousands of a second). Using this, we can work out the power delivered to their face as power equals energy divided by time. For example, an 800 watt microwave delivers 800 Joules of energy every second. In your punch situation, if we divide 157 Joules by 10 milliseconds, we get 15,700 watts of power. That’s the equivalent power of 20 microwave ovens, albeit over a very short time. So how can you deliver more power to the bad guy’s nose? If we look at the equation, we see that you can either increase your speed (v) and/or increase the amount of your mass (MG) you use in your strike. You can do both by stepping forward when you punch. This allows you to use your whole body (70kg) instead of just your arm. It also allows you to increase your relative speed by adding the speed of your body to the speed of your arm (so v goes from 7m/s to 10m/s). This gives us 10 times more energy than before, which is the equivalent of about 200 microwave ovens. However, I don’t recommend that you punch your frozen lasagne in order to cook it for your dinner. Now, the other way physicists analyse collisions is to look at the forces involved. Basically, the force of your punch (impact force) causes stress in your attackers bones causing damage. To work out the size of this impact force, we need to understand momentum and impulse. Momentum is basically how hard it is to slow something done. For example a cruise ship coming into Dublin port has a huge mass (m) and a relatively small speed (v). But this would be very hard to stop because of its large momentum (p), as momentum is mass times speed (p=m x v). The momentum of your punch is the mass of your arm (7kg) multiplied by your arm’s speed (7m/s) giving you a momentum of 49 kg.m/s. When you hit the bad guy’s face, your hand stops and your momentum goes to zero. This gives you a change of momentum of 49 kg.m/s. This change in momentum is caused by the impact force (F) between your hand and their face. As we mentioned earlier, that contact time lasts for about 10 milliseconds. Dividing these two numbers gives us an impact force of 4900 Newtons. But what happens when you apply 4900 Newtons to the bad guy’s head? As a comparison, assume you have a cow with a mass of 500 kg. If you drop the cow on the bad guy's head, it will have an acceleration of 10 m/s/s. Combining these two numbers means that the cow will hit the bad guy with a force of 5000 Newtons. So it is comforting to know that if you don’t happen to have a cow with you, your Taekwon-Do punch will have the same effect! Research done in the 1970s and 1980s have also shown us that the force required to break a bone is about 3000 Newtons. Again we can see that a Taekwon-Do punch can deliver enough force to break a bone. But in Taekwon-Do, we really are nice guys, and we don’t like hurting each other. So we will often test our skills by breaking pieces of wood and concrete instead. The same research has shown that the force required to break a piece of timber is also about 3000 Newtons. Martial artists have been testing their skills on timber for a long time, knowing that if they can break a piece of timber with a punch, that it is an effective punch and this builds confidence in their technique. However, it is nice to know that physics has confirmed what martial artists have known intuitively. 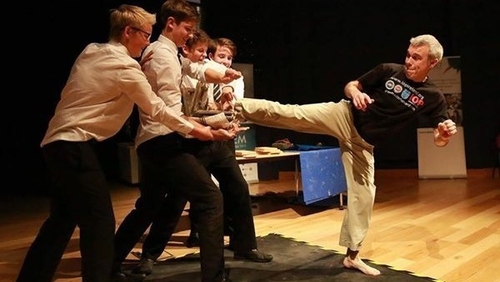 As a physicist and martial artist, it is nice to see traditional knowledge combining with scientific research to enhance our understanding of how the human body can produce extraordinary feats of power and skill. Physics shows that a martial artist’s hands and feet can withstand forces much greater than those required to break wood and concrete. However, we all know it is easy to break your hand by tripping or falling. Therefore, it is important when performing these strikes and punches that we position our hand correctly. This ensures that in a collision between an attacker and a Taekwon-Do fist that the attacker’s nose comes out the loser.